Yes yes, I am terribly behind in blog posts. I'm working my way through October letter photos now. 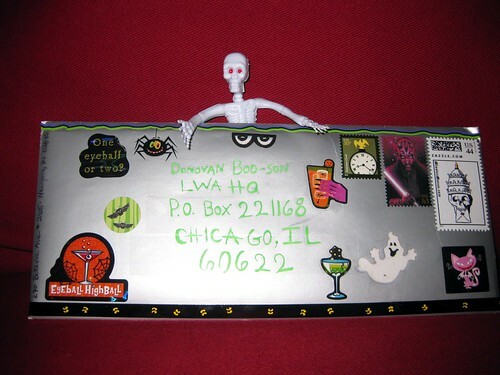 So, here we have one of my more decorative and exciting Halloween letters! I do hope the metallic silver envelope went through with no problems, along with the day-glo green gel pen ink for the address. (That ink isn't totally waterproof, so I covered it with tape.) 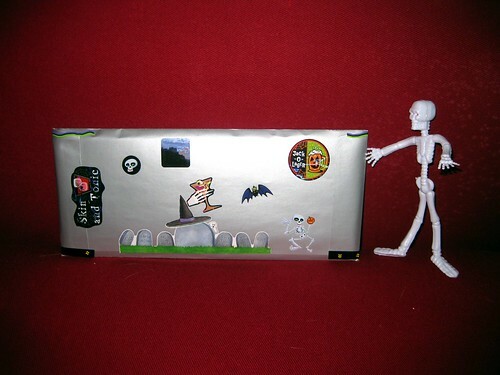 The envelope features some of my favorite Halloween stickers, and is being modeled by a cute bendy skeleton I got from one of the Letter Writers Alliance RSVP Halloween packages. Naturally, Soda had to get in on the photographic action. I took a bunch of her with this letter - she seemed really to like this one especially - but in an effort not to barrage you with a million Soda pictures, I just picked my favorite. And ta-daa! - the back. I love those stickers that make a play on words with favorite alcoholic beverages and spooky imagery... skin and tonic! Eyeball highball! HA! More spooky Halloween letters and postcards to come in future posts... because I know a lot of you readers, just like me, love Halloween year 'round. I wonder if it's the silver? Like us she's attracted to shiny objects? Awesome! Great job, and yes, please keep the Halloween posts coming! I never tire of Halloween! SnohomishWriter no longer exists!? I used to read it as well, but its no longer active on wordpress. I thought I should let you know as you have it on your blogroll? Maybe its been moved somewhere else? Anonymous, thanks for the heads up. I deleted that blog listing.